The day Sacha found out he could see witches was the worst day of his life. I’m really glad that this novel was acquired in a multi-book deal, because 300 pages is just not enough time to spend in Sacha Lassky’s alternate turn-of-the-last-century New York. 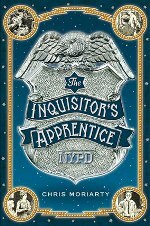 This book gets the ball rolling nicely, grounding us in Sacha’s particular family, neighborhood, and magical tradition before the plot spirals into the city’s wider world when Sacha gets a job with the NYPD’s most notorious Inquisitor. A fun range of characters and lots of action and magic. Next installment, please!